"I really believe the small liberal-arts institutions, in providing quality of education and intensity of experience, are simply not duplicated." Although William Chace had lived in California for more than 25 years before coming to Wesleyan as president, his origins were nonetheless in the East. He was born on September 3, 1938, in Newport News, Va., and received his bachelor's degree in English from Haverford College in 1961. A specialist in 20th-century literature, particularly in James Joyce, he received master's and doctoral degrees in English from the University of California, Berkeley. His published books include James Joyce: A Collection of Critical Essays, The Political Identities of Ezra Pound and T.S. Eliot, and The Critical Eye: Examinations of American Culture. When he won a Woodrow Wilson National Fellowship to teach at Stillman College, his experiences there confirmed his decision to become a teacher. He was also arrested during a civil rights demonstration, the only white among the 450 arrested. Upon returning to Stanford, he taught the first course in black literature there in 1968. Chace then taught at Berkeley and at Stanford before joining the administration at the latter institution. 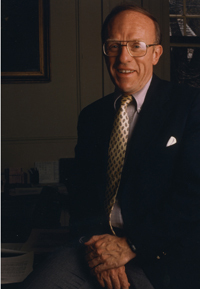 He was associate dean of the school of humanities and science from 1981 to 1985 and then vice provost for academic planning and development at Stanford from 1985 until he came to Wesleyan in 1988. Chace strengthened the academic program and refocused the mission of the university. He developed a five-year master plan, the University Plan, to integrate academic and financial development. This resulted in a reduction in the size of the administrative staff, a six percent reduction in the size of the faculty, and a large reduction in annual operating expenses. The consolidation caused dissent, particularly among the faculty, which Chace attempted to ameliorate by encouraging faculty participation in decision making. In cutting costs while strengthening the academic program, particularly the curriculum for first-year students, Chace liked to say that he was "sharpening Wesleyan's silhouette." In 1994, Chace resigned to become president of Emory University.